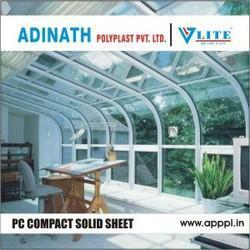 We, Adinath Poly Plast, commenced our functioning in the year 2009, as a manufacturer, supplier, wholesaler and distributor of this impeccable range of Polycarbonate Sheet. The highly praised and preferred range is made up of the finest Polycarbonate Sheet, which are widely praised and preferred in the market. The product’s superior sturdiness, durability, high capacity and unmatched resistance to corrosion, is widely praised. In addition to these, we offered our clients a commendable maintenance service at the most reasonable rate. The highly advanced state-of-the-art infrastructural facility at Adinath Poly Plast, has been laced with all the machinery, equipment and instruments, needed for the attainment of a number of the firm’s predefined goals and objectives. For reasons of finer and smoother management of the firm’s operations, we have parted our facility into several units, highly operational in nature. These units work in accordance with each other, to maximize our production capacity. Further, our highly ethical working habits and following of the industrial guidelines has helped gather a huge client base. Under the leadership of our Owner Mr. Vikas Pandey, we have managed to attain superior heights of success in just half a decade of our existence. His knowledge and understanding of the market and ability to manage, has always been a highly valuable asset to us. 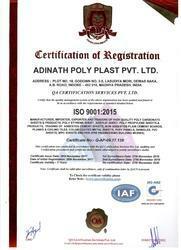 The highly advanced state-of-the-art infrastructural facility at Adinath Poly Plast Pvt Ltd, has been equipped with the equipment and machinery, needed for the attainment of several of the firm’s predefined goals and objectives. For reasons of maximizing our presence in the market, we keep upgrading the facility on a highly regular basis. In addition to this, to achieve smoother and finer management of the firm’s operations, We have parted our facility into several units. These units help us maximize the firm’s productivity and maintain the standard of quality. We are no. 1 in madhya pradesh. 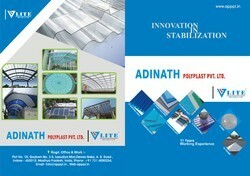 At Adinath Poly Plast Pvt Ltd, we have a highly a skilled set of professionals, who puts in all of their efforts and energy, to attain a number of the firm’s predefined goals and objectives. These professionals are recruited on the basis of their ability and willingness to perform. To attain smoother and effective management of the professionals operations, we have sorted the team into a number of highly operational units. These units work in compliance with each other, to maximize production capacity. Therefore, we conduct numerous training sessions and learning programs in order to make our employees comply with the technological developments. We are an ISO 9001:2015 certified company of india which is located in INDORE (Madhya Pradesh). 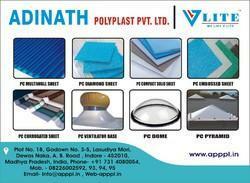 The finest range of Poly carbonate Roofing Sheet, is manufactured, supplied, distributed, wholesaled and traded by us. For reasons of maintaining this reputation, we engage in the utilization of high grade raw materials and modern machines, in compliance with the set industry norms and guidelines. Owing to this, the product is sturdy, durable, resistant to corrosion and has a fine finishing. In addition, the product’s punctual delivery and affordable pricing, makes us one of the primary preferences.